This is the story of how I decided to specialise in providing wedding entertainment. Since the age of 13 I have been singing in various bands or as solo artist performing at proms, birthday parties, in pubs and clubs. I wrote my own songs mainly but I also performaned cover songs. I have explored many music genres over the years including rock, pop, soul, funk, folk and R&B. Approximately 3 years ago, one of my best friends asked me to sing her down the aisle at her wedding. I never thought about singing at weddings to this date. When she asked me, I felt extremely honoured. 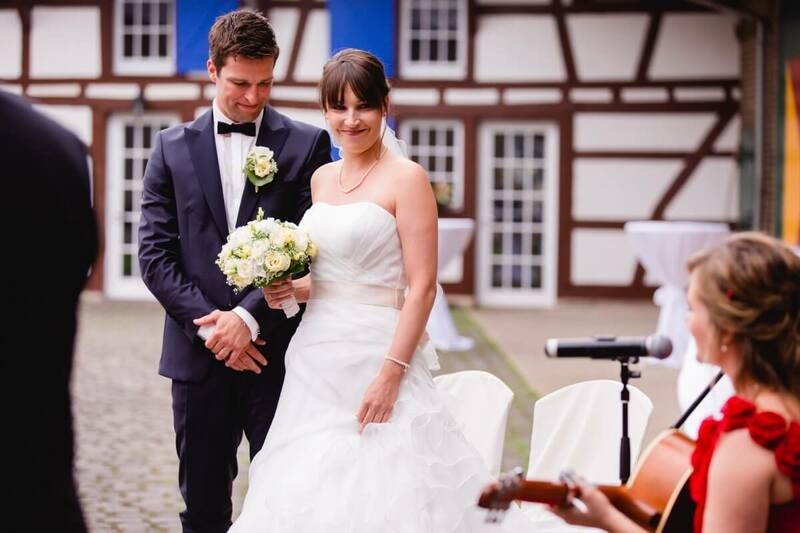 Because her wedding was in Germany and none of my band members could join me I learned the songs she requested acoustically (just acoustic guitar and voice). It was the best performance I have ever had to that date. I just loved singing her down the aisle and singing ‘their song’ after they exchanged vows. Almost every single guest of the 100 guests approached me complimenting me on my singing and commenting on the beautiful atmosphere I created with my music. I also had a few couples approach me asking if I could please play at their wedding. Due to the fact that I am permanently living in Australia I had to politely decline. As sad I as I was that I couldn’t help those couples I knew that was my sign: after over 15 years I finally found my place for singing – weddings! I took this concept of covering songs acoustically just by myself to Australia and started my own business the same month I got back from Germany in August 2015. I couldn’t be happier and I love every wedding I do because every wedding is different. Being part of a couples most important day in their life is such an honour. This entry was posted in Weddings and tagged acousticcovers, acousticsinger, adelaidemusicians, ceremonymusic, weddingmusic, weddingmusicadelaide.